2019 Production Sale Videos and Information! Disclaimer: All videos were taken by us, immediately after clipping, with no professional help. This goes to show the docile dispositions of our bulls. Scroll down for videos of bulls. Pics/Videos of HEIFERS @ the bottom of page. 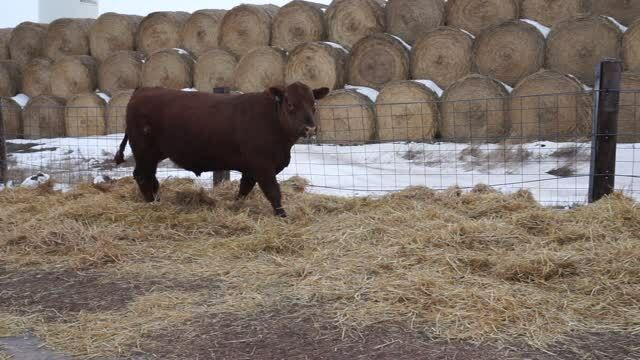 To view full pedigree and EPD's of each animal, or to cross reference our catalog, CLICK the corresponding REGISTRATION # of the animal or visit redangus.org ...... PLEASE feel free to come by and check out the bulls and heifers in person prior to sale day! 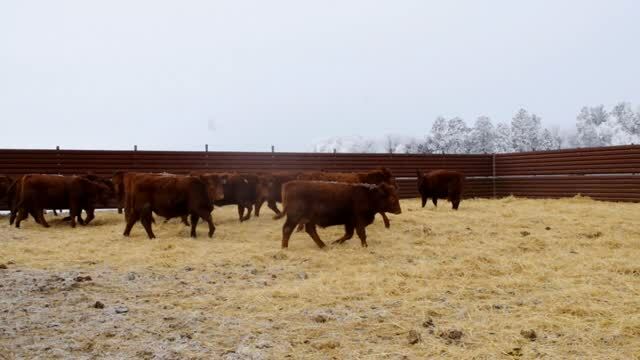 The bulls this year went out to grass April 24, 2018 and came home November 5, 2018. That's 195 days (6 months, 12 days). They were on nothing but grass and free choice salt/mineral. The group's Average Daily Gain (ADG) was 2.08 lbs. per day. 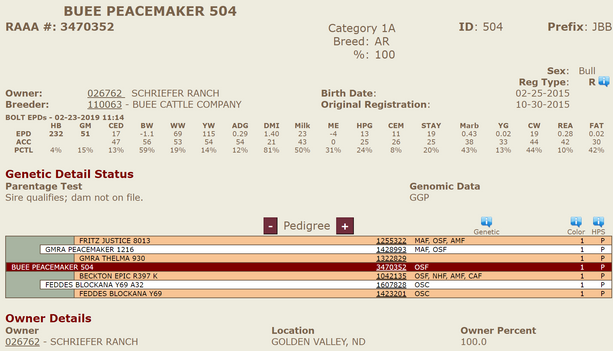 They have all been Genomic Tested along with the herd sires. We are waiting patiently for those to be processed and applied! - "Bases Loaded" This powerhouse has produced some awesome calves for us in both our commercial and registered herds. He adds POUNDS through depth, thickness, and length! We are excited as this is his first sale offering, and know you will like his sons as much as we do! We retained two of his sons that were 3/4 brothers for our own herd! 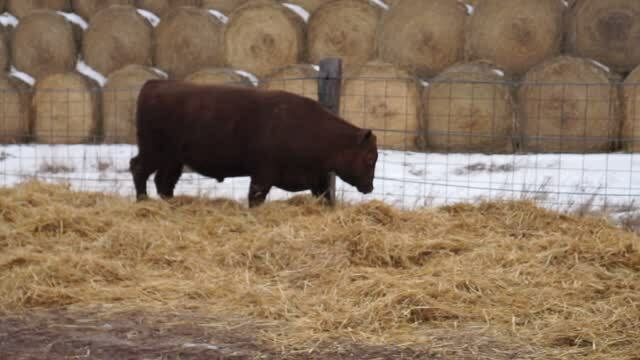 - "Oscar" A Bull that was born and raised on our place and has been a sure fire, dead-shot heifer bull! 110% Calving Ease! 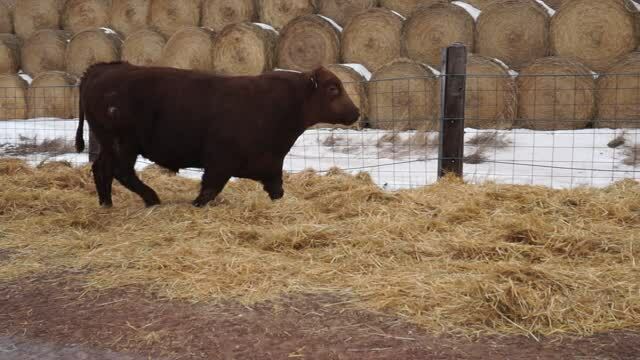 Produces very moderate frame cattle that still perform with very easy going dispositions! - "PM" as we call him has an extremely appealing balanced set of numbers and a Phenotype to go with it! 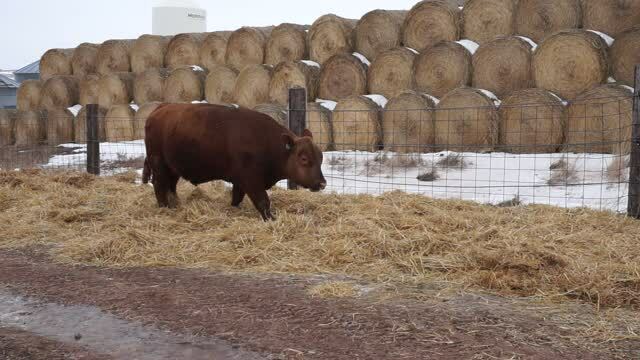 Performance and calving ease, this bull does the trick for the cowherd! Also his first sale offering this year! Another set of great numbers to check out! 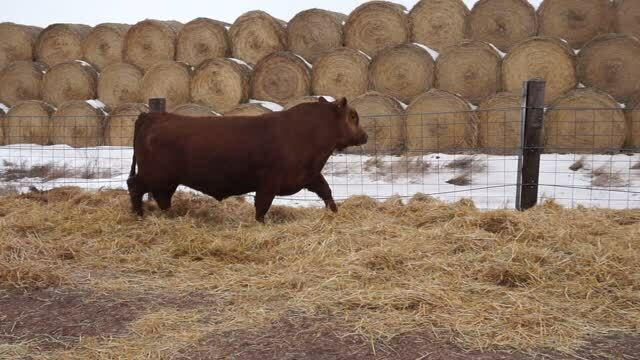 - "Magnum" added a lot of length and a nice dark red color to our herd through replacements we kept out of him. 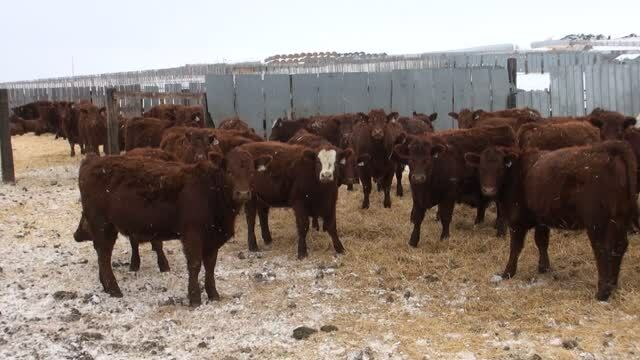 Calves would wean off at a good weight and perform well in the feedlot. Super easy going disposition; most of the time he loaded himself in the pasture when being pulled with no panels, four wheelers, or horses. You could walk him right on the trailer! - "4353" has a balance of performance, and calving ease. 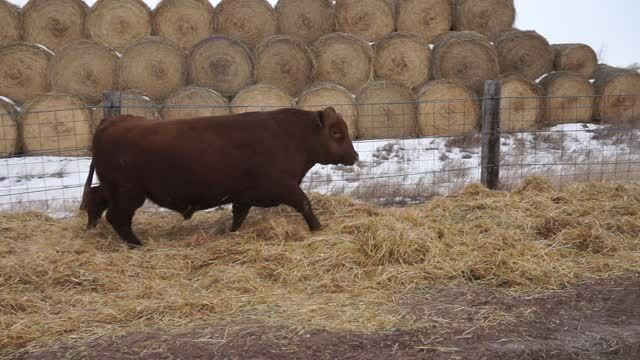 With the stretch of neck, smaller head, and clean shoulder that he has how can he not be a calving ease sire?? Don't stop there, because the length adds lbs and performance to his calves. 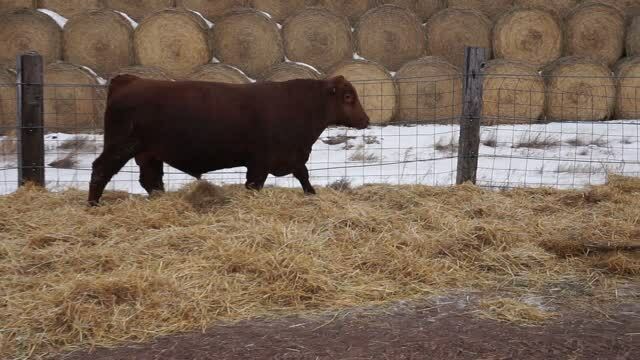 - We acquired just a few straws of Prime Cut and received 2 calves. 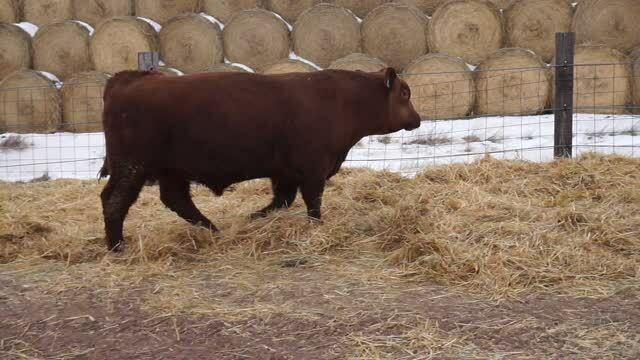 1 Bull, and 1 female. We retained the female for our own registered herd and are giving you the opportunity to own the 1 bull! *We Pay 50 % of the bull insurance premium if insurance is taken out on Sale Day! Martin-Trudeau Insurance will be there. *We will sell them in catalog order unless otherwise decided on Sale Day. 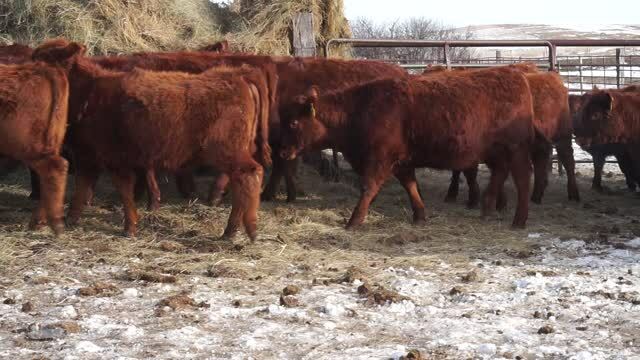 Commercial heifers will be first, and we will have a few guest consignors adding some more commercial open heifers to the sale! *EPD #'s and %'s are subject to change (Updated weekly by Association!). For the full list, most up to date, and accurate EPD's please check the RAAA website. We try our best to keep them updated on here, but sometimes we just don't get to it! We list the percentages of their top EPD's. 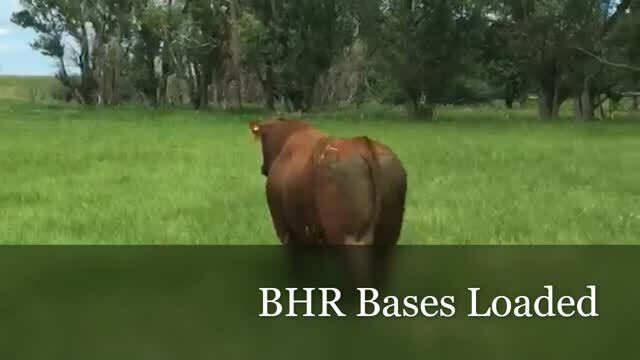 When looking at percentages; it is listed in the "top(#)%"...For Example: HB - 5% means that bull ranks in the breeds top 5% for the HerdBuilder EPD amongst the breed. 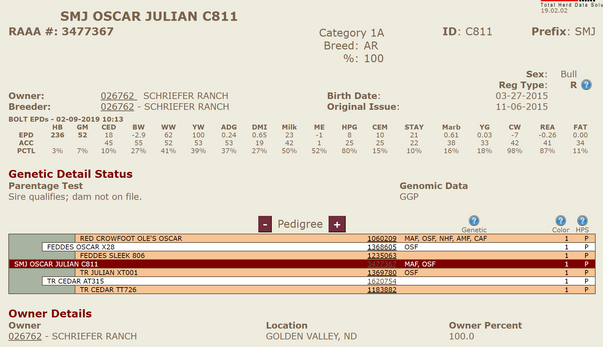 *All Bulls are Ultrasound Scanned and Genomic Tested. *Free Delivery within 300 miles of our Ranch. 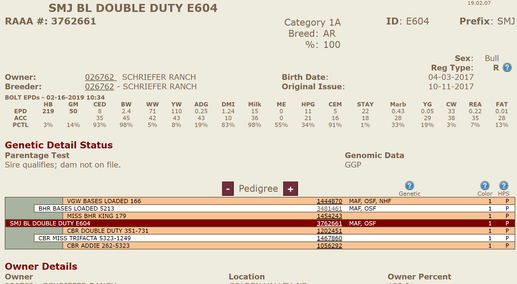 RAAA #: 3762661 <-- Click Here for Full Set of current EPD's, Pedigree, and info. A Good Bases Loaded son to start the sale off with! Don't miss him on Sale Day! 86 lb Actual BW with an Adjusted WW of 762 for a 106 ratio. 2.58 lbs/day ADG on 195 days of grass. First of the PM sons. REA ratio of 113!! Another #### making Bases Loaded Son out of a great cow! You will not want to miss this bull! 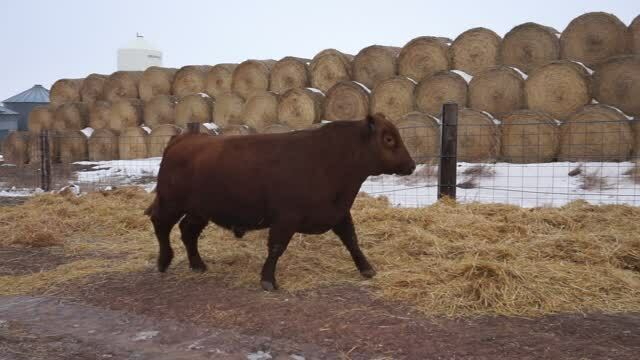 He is as long and thick as a loaded freight train that is sure going to make calves that look and weigh the same! With a nice disposition, and that dark red face that is so appealing; he sure makes you like him. He gained 2.27 lbs/day on 195 days of grass. Comes from a great Spur M cow that has produced a lot of high selling bulls for us in the past! 2.29 lbs/day ADG on Grass. Performance with a good Attitude! 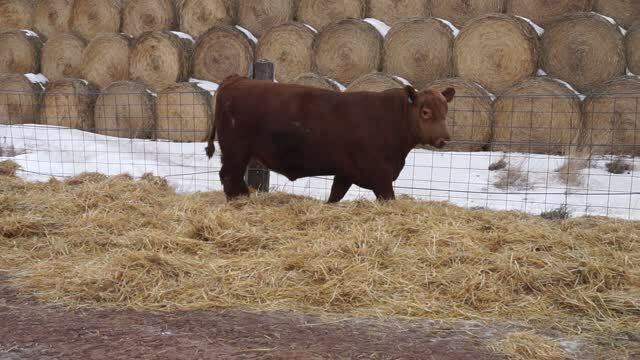 He is one of the easiest going bulls, with a sister in the replacement heifer pen that is equally as docile! He'll be sure to add lbs to your calves! This guy is a little tank! Calving ease with depth of rib. Balanced set of numbers to go with him. 7 EPD's in the top 20%!! 2.19 lbs/day ADG on Grass. 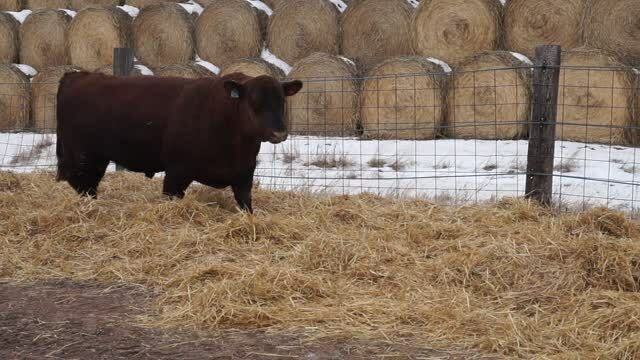 Looking for a Calving ease sire that you want to keep productive females out of? Look no further! His Dam will be 13 yrs old this Spring and is due to calve! 2.16 lbs/day ADG on grass for 195 days. 2.42 lbs/day ADG on grass. The one and only Prime Cut son in the sale. 82 Lb. Birth Weight, 104 REA ratio, and a whopping 128 IMF ratio! 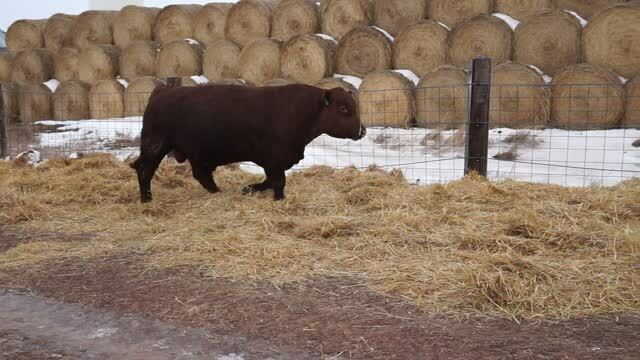 Don't miss this bull on Sale Day! With a balanced set of EPD's and performance stats to go with them, you will want this guy as your new Calving Ease Sire! He was a twin and the coyotes unfortunately got his brother at birth. 2.73 lbs/day ADG on Grass! !! 133 on BF !! !! 112 on REA !! If there is one thing these Magnum sons have in common it is their length. A nice Just Right 4353 bull. Another Bases Loaded son that has a balanced set of numbers to match his performance minded phenotype! !! 115 REA Ratio !! !! 113 IMF Ratio !! 5.2 Frame Score if you are looking to downsize the frame in the replacement pen without sacrificing length or depth! He has that dark red face that is so desirable! Another great Bases Loaded son. Don't let him slip through the ring without getting a bid in! He'll be a sure bet to add the lbs at the scale when your calves sell! This will be your last opportunity of the day to own a Bases Loaded son. Don't miss that opportunity! He Comes with a HUUUGE 146 Ratio IMF scan! And a monstrous 123 REA Ratio Scan !! Don't miss this Dark red, easy going Peacemaker son with a moderate 5.7 Frame Score. 2.11 lbs/day ADG on grass. 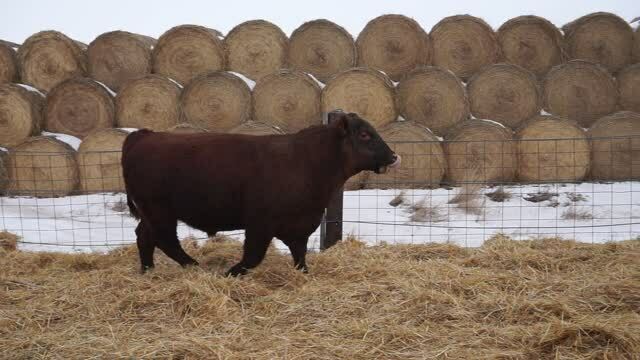 A good looking Magnum son, with a disposition to match to round out our sale! Below you will find pictures of a sample of our sale offering. 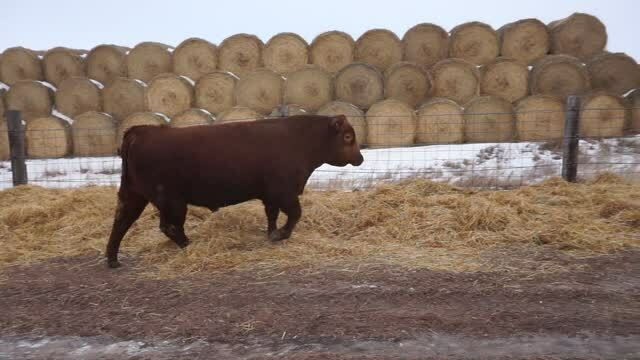 *There are 3 heifers in the video that do not fit (smaller) with the group and won't be selling with them. 43 hd in video-40 hd for sale.